Few governmental functions have been more important historically than managing water. Early in United States history, despite some questions over the constitutionality of the federal government getting involved in local and regional economic development, most people recognized that a partnership between government and the private sector was needed in order to plan for and manage the coastal and inland waterways of the new nation. The expenses involved in such activities as dredging rivers, constructing levees , and building canals were too great for private enterprise to undertake alone. Hence, Congress created federal agencies to assist with regional economic development projects and waterborne transportation systems. An 1802 statute created the Army Corps of Engineers, whose original purposes were to improve navigation on existing waterways and to explore western water routes for an expanding nation. Throughout the nineteenth century, army engineers distinguished themselves in the exploration and mapping of the continent. The most famous expedition was one by Lewis and Clark, who set out from St. Louis, Missouri, in May 1804 to find a route to the Pacific Ocean. An 1824 act of Congress established the Army Corps of Engineers as the nation's preeminent water resources manager. It appropriated funds for improving navigation on the Mississippi and Ohio Rivers, and it authorized the agency's engineers to use their expertise in determining the most practicable way of doing so. Legislation passed in 1850 added water resources planning to the Corps' responsibilities, and in 1879 a Mississippi River Commission was established, with the Corps in charge of planning for an entire river basin. The agency's interest in planning and managing the nation's waterways continues to this day in the form of numerous activites, including channelization projects, dredge and fill activities, harbor improvements, floodplain management , and the construction and maintenance of a vast system of locks and dams on the nation's largest rivers. In 1902, a second federal agency, the U.S. Bureau of Reclamation, was created to deal with the physical and hydrological conditions peculiar to the western United States. As the celebrated explorer John Wesley Powell (1834–1902) pointed out, the western two-thirds of the continent was arid . What worked in the East could not work in the West, and so the federal government established a reclamation fund and a bureau for the express purpose of "reclaiming" desert lands for agricultural and municipal uses. Whereas the Army Corps of Engineers was given authority to undertake projects throughout the entire United States, the Bureau of Reclamation was limited by statute to working in the sixteen westernmost states. Nevertheless, the Bureau, like the Corps, developed into a powerful planner and manager of water resources during the twentieth century. 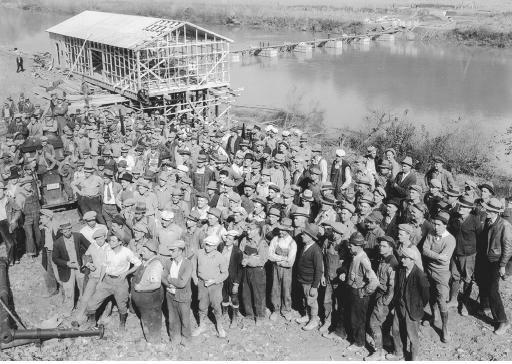 The establishment of the Tennessee Valley Authority in 1933 was a bold experiment designed to integrate the use of all natural resources in a river basin. The TVA project, and other large federal water projects, also created jobs and contributed to the ongoing economic development of the regions in which they were built. up the TVA. The work undertaken by the agency in the 1930s, during the worst years of the Great Depression, greatly assisted the economic and social rehabilitation of an entire region. The TVA today continues to be a significant component of the nation's water planning and management infrastructure. Throughout most of the twentieth century, the U.S. Army Corps of Engineers and the Bureau of Reclamation, and the TVA, utilized the Progressive Era concepts of conservation and multipurpose development to guide their planning of water resources projects. Conservation at the turn of the century meant using a scarce resource such as water to the fullest extent possible. It dovetailed with the multipurpose idea, in that the construction of a dam, for example, not only would provide flood control but also would store waters behind the dam for use as drinking water, for recreation, and for irrigation of crops. The 1909 Rivers and Harbors Act authorized the agencies to additionally consider the provision of hydroelectric power in their planning. At the same time, president Theodore Roosevelt (1858–1919) and other policymakers stressed the need for comprehensive river basin planning as the best approach to the conservation of the nation's resources. During the depths of the Great Depression in the 1930s, president Franklin Roosevelt (1882–1945) used the federal water agencies to help jump-start a nearly prostrate economy. Huge construction projects involving the most sophisticated planning were undertaken, including Hoover Dam on the Arizona-Nevada border; Bonneville and Grand Coulee Dams in Washington and Oregon; Norris Dam and others in the Tennessee River Valley; and Shasta Dam in California. (The construction of dams on virtually every major river in America would continue for two more decades.) In the important 1936 Flood Control Act, Congress mandated the Army Corps of Engineers to employ a form of economic analysis known as benefit-cost analysis in its project planning. Other federal agencies quickly followed suit. In 1950, policymakers in Washington, D.C. undertook a comprehensive review and analysis of water resources planning and management. Known as the Green Book for the color of its cover, the report presented the classic economic efficiency model as the standard for analysis. In 1958, the Green Book was revised and published with the title, Proposed Practices for Economic Analysis of River Basin Projects. It covered the basic concepts of benefit-cost analysis, principles and procedures for project and program formulation, analysis of various project purposes, and cost allocation methods. Most of the report's findings were incorporated into the President's Bureau of the Budget guidelines for water planning and management known as Circular A-47. This document went into effect in 1953. Both documents contained the prevailing philosophy of the era, which was that the federal government's role in water resources planning and management should reflect state-of-the-art economic analysis. In addition, opinion at that time dictated that federal projects should not be undertaken unless their net benefits exceeded their costs, and that national economic development was the primary goal of federal project planning. During the 1960s, environmentalists challenged many of the report's basic assumptions. Although classical economic analysis was not abandoned by federal water agencies, it was significantly modified in ensuing decades. For more than 150 years, water planning and management in the United States had as its principal goals economic and social development. It was spectacularly successful. By the end of the Second World War (1939–1945), the United States was an economic superpower rivaled only by the former Soviet Union. But beginning about mid-twentieth-century, the recognition spread in the United States that economic development, urbanization, and population growth came at a heavy cost to the natural environment. A major change in societal values occurred in the 1960s and 1970s, and these values became increasingly reflected in the water resources policy arena. As the twenty-first century opened, for example, the Bureau of Reclamation no longer considered itself a construction agency, but instead a management and planning organization that employs watershed management and river basin planning to assist states and the private sector in meeting all water needs of an arid but highly populated West. For its part, the Corps continues to be a construction and engineering agency, but is also pursuing a number of more environmentally sensitive programs such as wetland protection, mitigation banking , floodplain management, and watershed planning. Responding to a public opinion which highly values environmental protection, both Congressional legislators and all recent presidents have encouraged the Corps and the Bureau, as well as other federal resource agencies, to pursue these new directions. SEE ALSO Army Corps of Engineers, U.S. ; Bureau of Reclamation, U.S. ; Canals ; Dams ; Drought Management ; Economic Development ; Floodplain Management ; Hoover Dam ; Legislation, Federal Water ; Lewis, Meriwether and William Clark ; Planning and Management, Water Resources ; Ports and Harbors ; Powell, John Wesley ; Reisner, Marc ; River Basin Planning ; Sustainable Development ; Tennessee Valley Authority ; Transportation . Clarke, Jeanne Nienaber, and Daniel C. McCool. Staking Out the Terrain: Power and Performance among Natural Resource Agencies, 2nd ed. Albany: State University of New York Press, 1996. Lilienthal, David E. The TVA: Democracy on the March. New York: HarperCollins, 1944. National Research Council. New Directions in Water Resources Planning for the U.S. Army Corps of Engineers. Washington, D.C.: National Academies Press, 1999. Reisner, Marc. Cadillac Desert: The American West and Its Disappearing Water. New York: Penguin, 1986. Rogers, Peter. America's Water: Federal Roles and Responsibilities. Cambridge, MA: MIT Press, 1993.